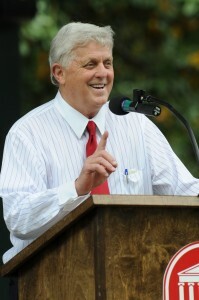 Robert C. Khayat – Chancellor of the University of Mississippi from 1995 to 2009 and leader of what has been aptly described as a “renaissance at Ole Miss” – has been chosen the 2016 Legacy Award recipient by the Ole Miss Women’s Council for Philanthropy. The OMWC and presenting sponsor C Spire will honor the leader during events being planned for April of next year. Khayat was chancellor when the OMWC was formed and has continued to be a source of support and encouragement to the Council, calling its scholarships some of the most “innovative in the nation.” In addition, Khayat established an OMWC scholarship to honor the contributions and support of his wife, Margaret, in her role as Ole Miss’ First Lady. Karen Moore, OMWC chair, says Robert Khayat personifies a servant leader. “We use the Legacy Award to honor someone who epitomizes leadership, mentorship, and philanthropy, the three flagship components of our program. These are also areas we want our scholars to be mindful of when they graduate. We could not find a better example of these attributes than Robert Khayat. He has had tremendous influence on our university’s achievements, as well as his fingerprints on universal changes. When you hear amazing leaders’ success stories, they always talk about giving back, being inclusive, leaving their places of leadership stronger than when they began, and encouraging others to succeed. This perfectly describes Dr. Khayat. As chancellor, he helped found an honors college and institutes of international studies, leadership, and racial reconciliation. He secured a coveted Phi Beta Kappa chapter, attracted millions in private support, and hosted the 2008 Presidential Debate. He transformed the campus through renovation, beautiful landscaping and new construction – including adult and children’s hospitals, a chapel, a performing arts center, and an indoor athletics practice facility. Under Khayat’s leadership, student enrollment increased by 70 percent and the University’s budget grew from $500 million to $1.5 billion annually. A memoir by Khayat, The Education of a Lifetime, has been selected for the University’s 2015 Common Reading Experience. Each incoming freshman has received a copy of the book and has been asked to read it before the start of fall classes. Khayat will then speak at the fall convocation. Khayat joins a prestigious list of Legacy Award recipients, including nationally recognized names such as Charles Overby (68, BA ‘14), Donna and Jim (BBA ‘65) Barksdale; Gov. William (BA ‘43, LLB’ 49) and Elise (BA ‘48) Winter; Olivia Manning (‘71), and Leigh Ann Tuohy (BS ‘82). Proceeds from Legacy Award events help fund OMWC mentoring and leadership programs.